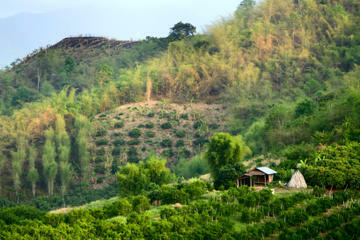 Chiang Mai is essentially Thailand's second city - the smaller, more relaxed answer to the madness of Bangkok. It was once the capital of the Lanna Kingdom, but now is a major draw for backpackers and travelers of all kinds, not to mention retiring expats and humanitarians. Many who come here return again and again, or stay for years when they had meant to stay only a few weeks. There's an energy in the city that captivates those who visit, whether they seek a trekking adventure or a spiritual awakening as they travel from temple to temple. This mountaintop temple is a must-see in Chiang Mai. Wat Doi Suthep's central shrine contains a much-revered seated Buddha and is one of the most popular tourist attractions in the city. You can reach the temple by hiking up the mountain (a sweaty but surely memorable endeavor), renting a motorbike, or hopping into a songthaew (red trucks that essentially operate as communal cabs). The drive is a short one, so you can do this whole trip in about two hours. At the base of the staircase leading up to the temple, you'll find vendors selling souvenirs, antiques, and snacks. Brace yourself for the climb because the staircase is steep, but the effort is well worth it. Statues of two demons guard the entrance to the temple precinct. Generally only two of the six gates leading to the gallery and the chedis are open. 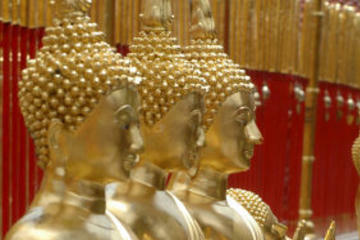 The gallery is adorned with statues of Buddha in the Chiang Mai and Sukhothai styles. The temple itself is ornate, with many representations of the Buddha, detailed dragon statues, and elephant carvings. There is also a small museum on the premises. On a clear day (and most of them are clear, unless you're visiting during the rainy or burning seasons), you can look out over the entire city and spot the chedis atop other wats poking out among the clustered buildings. If you're wearing shorts, you will be required to put on a sarong-like wrap to cover your legs. It is advised to cover your shoulders and your legs at least past your knees when visiting any temple. There is a small fee to enter the temple complex. This small Hmong village is admittedly more tourist oriented than authentic. Yet there is a small exhibit of a traditional hill tribe home and information on the history of the many groups that have settled in the Thai mountains in past generations. If you're feeling particularly touristy, you can dress up in ethnic garb for a photo shoot, and there are many small shops where you can purchase hand-woven textiles, handmade jewelry, tea, and other goods. You can also explore a large garden with a diverse array of plants and enjoy breathtaking views from the village. Stop for lunch at one of the small restaurants overlooking the greenery below and order a hot bowl of khao soi, Chiang Mai's most famous dish. It's a good idea to add this to your itinerary the same day you visit Doi Suthep, since you only need to drive a bit farther into the mountains to reach Doi Pui. Enjoy the ride; it's a beautiful one. This is the highest peak in Thailand, and the national park that surrounds it is filled with some of the many natural wonders that make the country such a draw in the first place. You can do some trekking and hike the mountain, or take a more leisurely route around the park. Several waterfalls and a hill tribe village are other attractions, along with two pagodas built to honor King Bhumibol Adulyadej and Queen Sirikit. You'll want to either hire a driver for the day or rent a motorbike and see the sites on your own, as you won't be able to make your way through the entire park on foot. But it's only about a two-hour drive from the city, so if you leave early, you can get in a full and satisfying day on the mountain. Ruins aren't exactly a rare sight in Chiang Mai, or in Thailand generally, for that matter. But there's something about Wat Chedi Luang that is particularly beautiful and haunting. Constructed in 1401, the imposing structure was damaged during an earthquake in 1545. But it remains remarkable today, and you can still see the massive elephant carvings that adorn it. This temple stands at the heart of the Old City, which is where travelers spend much of their time. Amid the sois, or alleys, and heavy motorbike traffic, Wat Prasingh rises at the end of Rachadamnoen Road. 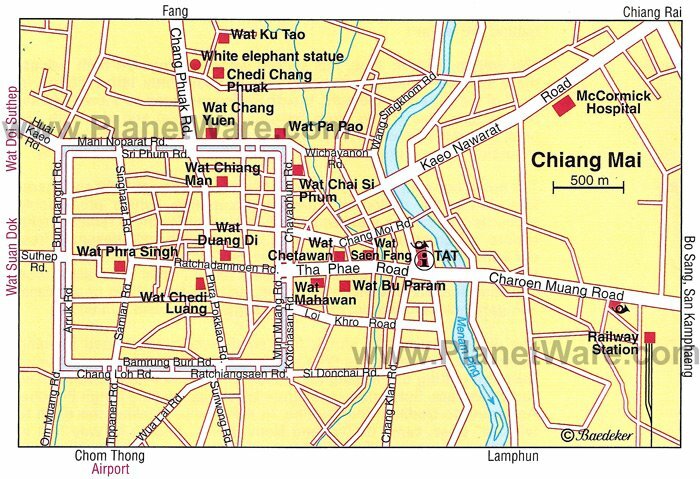 It is the largest wat in the city and dates to 1345, when an ancient king built it in his father's honor. The father's ashes are still buried on the grounds - but don't let that spook you from visiting. The decadent structures are impressive, and it's an especially great place to check out on Sundays. The wat's most sacred shrine is a small building called the Phra Viharn Lai Kam, erected during the reign of King San Muang Ma (1385-1401) to house the famous, now sadly headless, Sukhothai-style figure known as the Phra Singh Buddha. According to tradition, the Buddha, in the familiar "calling the earth to witness" pose, came to Thailand from Ceylon, finding its way first to Ayutthaya and then to Kamphaeng Phet, Chiang Rai, Luang Prabang, and back again to Ayutthaya before, in 1767, arriving in Chiang Mai, where it has been ever since (but there are doubts as to the relic's authenticity). Head to Wat Prasingh in the early afternoon, and you'll have a chance to browse a market on the grounds, perusing creative souvenirs and sampling fresh juices and teas after visiting the temple. This is the place to find the best street food in Chiang Mai. Every night, vendors set up at the Chiang Mai Gate and sell everything from pad kra pow (spicy meat and basil dish) to the perfect dessert of fresh mango sticky rice topped with coconut milk. Do yourself a favor and order a smoothie from Mrs Pa. Her stand is located directly across from the 7-Eleven and says Pa's Smoothies on the sign. Your best bet is to let her mix up a concoction of her devising; you can never go wrong this way. The market is held seven nights a week, but it's best to go on weeknights since there are fewer vendors on Saturday and Sunday evenings. If you're wondering where to get your street grub on during the weekend, fear not. Chiang Mai has a market for every occasion. The Sunday Walking Street is a must for eating and shopping in Chiang Mai. Go early, though, if you're not one for crowds. The main market thoroughfare is Rachadamnoen Road, which begins just behind Thapae Gate, where you'll find vendors selling handcrafted lamps, dolls, soaps, jewelry, clothes, Christmas ornaments, local handicrafts, and just about every other keepsake you can imagine. As you reach the end of the first block of Rachadamnoen, you'll find yourself flanked by two temples. The courtyards of both are filled with food stalls offering a grand mix of pad Thai, Japanese curry, sushi for 15 cents a piece, samosas, fried bananas, and dumplings. The market stretches the length of the road, and if you're interested in doing any shopping at all, leave yourself several hours to wander, shop, and eat. Also make sure to be patient, as the throngs can make it slow going when it comes to browsing. The Saturday Walking Street on Wualai Road is a slightly tamer, and slightly less crowded, version of the Sunday market. You'll find it just behind the Chiang Mai Gate, and it's a great place to pick up hand-woven clothing, pillow covers, purses, wallets, and other items sold by members of local hill tribe communities. There are many elephant camps around Chiang Mai, but all are not created equal. Many have been criticized as treating the animals poorly and overworking them. Elephant Nature Park is not one of these places. Visitors are invited to spend a day volunteering with the elephants, feeding them, and bathing them in the river. Most of the elephants are rescues, having suffered as show or labor animals. Once they come to ENP, they are no longer workers and are treated gently and respectfully. A day spent here is an eye-opening experience, as you get to spend time up close with the elephants and learn about their plight. The cost of volunteering includes transportation and lunch, and the money goes toward maintaining the grounds and providing for the animals. Be sure to book in advance, as the volunteer spots do fill up ahead of time. You'll definitely want to spend a day outside the city checking this place out. The wooded area surrounding the falls is serene and peaceful, but the real draw is the fact that you can walk up the falls. The limestone is "sticky" even as the water runs over it, so you can climb up and down to your heart's content. It's a real treat and provides a welcome complement to some of the more traditional tourist activities. Aim to go on a weekday, since the place is fairly crowded on weekends. For between a few hundred and a thousand Thai baht, you can hire a songthaew or tuk-tuk driver to take you out and back. This is a perfect place to laze away a day under the Thai sun, surrounded by hills and with a lake to swim in at your leisure. This reservoir is popular with locals and expats. You can rent a hut on the lake for the equivalent of a few dollars and a huge tube to lounge on in the water for a small fee. Don't worry about packing lunch because you can order fresh fish and other dishes from the local kitchens. And it's only about 10 kilometers from the city, so it makes a perfect day trip. You can hire a driver and negotiate a pickup and drop-off rate. It's worth purchasing an inexpensive Thai SIM card, so you can give the driver a call if you need to make adjustments to your meeting times. At Art in Paradise, you can surf a big wave, ride a magic carpet, and stand amid an erupting volcano, or at least look as though you are. This illusion art museum displays 3D art that has an incredibly realistic effect, providing plenty of fantastic photo opportunities. The collection includes more than 130 photos divided into different zones, such as the underwater world, wildlife, Ancient Egypt, and European cities. Pose for photos in the scenes of your choice for fun mementos of your visit. Luxury Hotels: Minutes from the Old City and Night Market yet in a tranquil Riverside location, Anantara Chiang Mai Resort is a stylish sanctuary with contemporary Asian accents. Also within walking distance to the Old City is the more intimate colonial-style Ping Nakara Boutique Hotel & Spa with charming gingerbread trim. Seemingly a world away from all the hustle and bustle, yet only 10-minutes via a hotel shuttle from the Old City, The Dhara Dhevi Chiang Mai is a sumptuous villa resort in the style of an ancient palace set amid 60 acres of lush tropical gardens. Mid-Range Hotels: An excellent mid-range option in the heart of the city is the Golden Bell Hotel next to the Sunday Walking Street market. If you're seeking a little more serenity, two good-value boutique hotels on the outskirts of the city include Rimping Village, a ten-minute walk from the Night Market, and Shewe Wana Boutique Resort and Spa, with easy access via tuk tuk to all the top attractions. Budget Hotels: If you're on a budget, Varada Place offers excellent value within walking distance of the Old City, while Vanilla Place Guest House and Rustic River Boutique are also centrally located, a short hop from the Night Bazaar. Temple Tour: Temples are one of the main attractions of Chiang Mai, and the Private Tour: Chiang Mai City and Temples three-hour excursion covers all the highlights with the bonus of an experienced guide. The itinerary includes a visit to the sacred Wat Phrathat Doi Suthep, with spectacular views from high on the summit of of Doi Suthep. Day Trips: Adventures abound in the beautiful countryside surrounding Chiang Mai, and taking a tour is a great way to make sure you see all the highlights without worrying about finding your way around. On the Chiang Rai and Golden Triangle Day Tour, you can enjoy spectacular views from a lookout over the borders where three countries meet: Thailand, Burma, and Laos. This full-day guided tour includes convenient hotel pickup and drop-off in an air-conditioned vehicle, a therapeutic soak in hot springs, and a visit to a temple and local hill tribe villages. On the Chiang Mai Rainforest Canopy Zipline Adventure, you can zoom through the treetops and enjoy a bird's-eye view of the jungle. This exciting seven-hour tour includes an 18-course zipline with hanging bridges and rappel descents, a hike up to the picturesque Mae Kampong Falls, and the chance to glimpse gibbons in the wild. Also included in the tour are convenient hotel pickup and drop-off, entrance fees, a Thai-style lunch, and transportation in an air-conditioned luxury van. From palaces to picturesque beaches, Thailand is packed with plenty of things to do. Near Chiang Mai, beautiful Mae Hong Son blends both the Thai and Burmese cultures. In Bangkok you can explore sacred temples and the magnificent Grand Palace, while the old Thai capital of Ayutthaya is a UNESCO World Heritage Site. Not far from Bangkok lies the bustling beach resort of Pattaya, the historical attractions and national parks of Kanchanaburi, and the Buddhist monuments of Nakhon Pathom. A short flight from the capital is Surat Thani Province, with the popular islands of Koh Samui and Koh Phangan, and Phuket Island, with plenty of appealing day trips, including Khao Yai National Park.